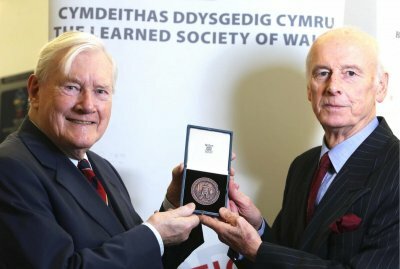 The Learned Society of Wales is pleased to announce that the Welsh engineer and entrepreneur, Sir Terry Matthews Kt OBE PEng FIEE FREng, will be the first recipient of the Society’s prestigious Menelaus Medal. The Medal, which is sponsored by the South Wales Institute of Engineers Educational Trust (SWIEET2007), is awarded for “excellence in any field of engineering and technology to an academic, to an industrial researcher, or to an industrial practitioner who is resident in Wales, or who is of Welsh birth but is resident elsewhere, or who otherwise has a particular connection with Wales”. The Medal will be presented during a ceremony which will be held in Physiology Lecture Theatre ‘B’ (C-/1.04) in the Sir Martin Evans Building, Cardiff University, Museum Avenue, Cardiff CF10 3AX, at 11.00 a.m. on Wednesday, 3 July 2013. All are welcome to attend. Immediately following the ceremony, Sir Terry will give a public lecture on the theme of supporting and mentoring a next generation of business people, to create an economic growth engine for Wales, targeting world markets.